Heat oven to 375°F. In 2-quart saucepan over medium heat, melt 3 tablespoons of the butter. Add onion; cook and stir until softened, about 3 minutes. Stir in spinach, dill weed and flour. Cook an additional 5 minutes or until most of the liquid is absorbed. Remove from heat; stir in feta cheese, eggs, garlic powder, salt and pepper. Set aside. Lightly spray 13x9-inch glass baking dish with Crisco® Original No-Stick Cooking Spray. Unroll 1 dough sheet in bottom of dish, stretching slightly to fit. Spread spinach mixture over dough. Unroll remaining dough sheet; stretch slightly and place over spinach mixture. In small microwavable bowl, microwave remaining 1 tablespoon butter on High 15 seconds or until melted. Brush butter over top of dough; sprinkle with almonds. Bake 19 to 24 minutes or until filling is set and top is golden brown. Cool 5 minutes. Meanwhile, to make sauce, in 1-quart saucepan over medium heat, cook apricot preserves, vinegar and crushed red pepper. Bring to a boil; reduce heat to low and continue cooking until slightly thickened, 4 to 5 minutes, stirring frequently. 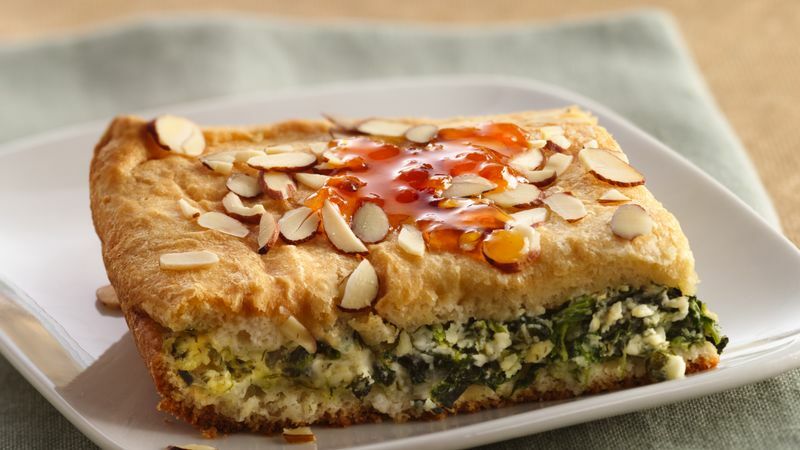 To serve, cut spanakopita into 8 squares. Place squares on individual plates; drizzle each with warm sauce.